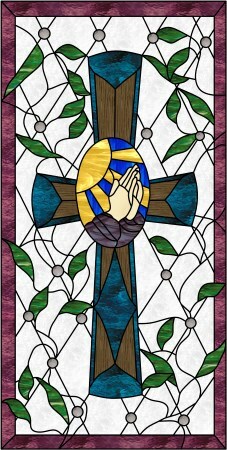 I had never considered making stained glass art until I began working in a warehouse of sorts that had a studio at one end. I was terrified of getting cut, and even though my great-grandfather, father, brother and son are all incredible draftsmen, I personally cannot draw well enough to win the favor of preschoolers. It wasn't long before my career at the warehouse was about to come to an end, and I was told that if I wanted to remain employed there I needed to learn stained glass. Never being one to turn down a challenge, I jumped in with both feet and was surprised to discover that I really enjoyed working with glass. The owner of the studio would sketch patterns for days, have a discussion with a client, erase half the drawing and then redraw the areas the client had suggested. Oftentimes I would hear the client eventually tell the studio owner that she had it right in the first draft, and ask for the design to be redrawn as it was originally. I've always been computer savvy, and I figured there had to be software that would make creating pattern easier. I learned about Glass Eye 2000,	downloaded the trial on my own home computer to see what it was all about, and immediately became hooked! Although I was very excited to bring this news to work, the studio was run "old school," the way the art had been done for centuries. Undaunted, I put in the effort to learn the program well enough that I purchased the Standard Edition before the trial was finished. A dear friend answered my questions over and over again, and eventually I was doing well enough to have the confidence to begin creating glass panels and suncatchers from my own patterns. Thirteen years later I upgraded myself to the Professional Edition, and now wonder how I ever got along without all the new abilities! Glass Eye 2000 allows me to put my imagination into a pattern, to test my ideas, and explore my curiosity in such a way that would never have been possible before. Yes, I can draw … using the computer! Better than that, I get to color … all day, if I want to … and share realistic images with my friends, family, and clients. When a client requests a change, I can quickly copy the original pattern, make changes as many times as they like, undo whatever changes they reconsider, and quickly complete an approved design in a time frame comfortable to everyone. Very often a client will marvel how close the finished panel is to the rendering they approved. Without	Glass Eye 2000, my glass business would never have been what it is today, if it would have been anything at all. The support the program offers is second to none, and other than one single suggestion in a future update there is nothing more I need to grow for many years to come. I use it daily, at the very least consulting the glass library to see if what I imagine will turn out to be a workable piece of art when I cut various types of glass. Having the ability to change the size at will, calculate expenses, supplies and suggested retail value saves me copious amounts of time and effort that I prefer to use in creation. "Praying Hands" is a design that came to me as I listened to a friend describe his step-parent. As he spoke, I imagined the closeness he described, the faith, the lessons taught, the hardships, the courage and the unity. This design, measuring 16.5" wide by 33" high, with 259 pieces, holds all of these concepts together. He watched the progress as I built the panel, and often told me that the design captured the story he had told me. The panel remains with me today, and everyone who looks upon it expresses a whispered "wow." 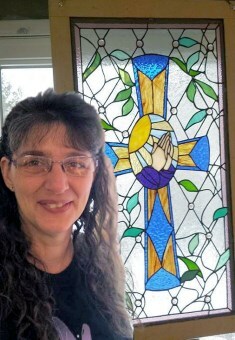 Kim Banks, of Ontario, Canada, has worked with stained glass for more than a dozen years. She began in a small spare bedroom, upgraded to a basement, and eventually into a brick and mortar storefront. She comes alive when challenged by clients and enjoys working with them to create custom orders. She welcomes repair work, in both traditional lead and Tiffany methods. Predominantly using social media, she has delivered many custom orders worldwide, with frequent repeat customers and referrals. She often donates completed pieces to her favorite charity, K9 Crusaders, to help fundraise for rescued animals. She is in the process of developing a program, with the support of a community outreach organization, to assist community members with disabilities and low income to learn confidence, patience and pride. Please visit her Facebook page or send her an email message.